Notice how I highlighted the fact that, at least according to this study, even SLIGHTLY elevated homocysteine levels could lead to problems in the bedroom. I don't know of any hormone or neurotransmitter where a researcher has said something equivalent. Notice also that this study looked at non-diabetic men with no heart disease. Basically, a big percentage of these men are probably wondering why in the world they have erectile dysfunction. They feel that they have been blind-sided. I see these kind of men all the time on The Peak Testosterone Forum. Yet the authors stated that homocysteine was the main determinant of erectile dysfunction in the non-diabetic men with no heart disease. 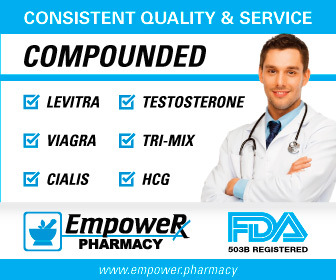 So, yes, it is something worth monitoring even if your doctor does not and is something you can do through one of the labs on this page: Inexpensive Testosterone Labs. As a verification, another study looked at men with erectile dysfunction and with and without coronary arterial disease (CAD). It found that men with erectile dysfunction and CAD had elevated ADMA levels. This indicates that elevated ADMA levels may acclerate arterial plaque which then negatively impacts erections in a significant subpopulation of men. As you will see below, this appears to be exactly what happens and I will discuss explain why a bit later. As you may have guessed by now, high homocysteine increases ADMA. It does this by negatively inhbiting the enzyme that breaks down ADMA, i.e. it effectively allows ADMA to build up in your system. (The name of this enzyme is dimethylarginine dimethylaminohydrolase (DDAH).) Researchers found that the more homocysteine, the more inhibition of DDAH and the greater the buildup of ADMA. 3. Increased Arterial Plaque (Atherosclerosis). Again, as mentioned above, researchers have noted that "both markedly and mildly elevated circulating homocysteine concentrations are associated with increased risk of vascular occlusion." Occlusion is the $10 word for blockage. In other words, elevated homosysteine is linked to blocked or clogged arteries. Again, I will call attention to the fact that these researchers said that even SLIGHTLY elevated homocysteine levels can lead to accelerated plaque. And it is no wonder considering that rising homocysteine leads to increased oxidation, inflammation and lowered nitric oxide levels. When it comes to your arterial health, it does everything dead wrong. a) Gut and GI Issues, such as Crohn's, diverticulitis, IBS, atrophic gastritis, celiac disease, etc. If you cannot absorb certain B vitamins, homocysteine levels will rise. b) Hypothyroidism leads to low stomach acid, which can lead to improper digestion of those B vitamins and, again, elevated homocysteine levels. c) MTHFR (dual homozygous) SNP can lead to elevated homocysteine levels. It is important that you take the correct form of folate. The traditional form is folic acid, which the liver has trouble breaking down, and is associated with increased cancer risk according to some research. (Folate stimulates DNA turnover, which is why pregnant women are advised to take it.) Most experts that I am reading now recommend the less common methylfolate form. This is critical for those with MTHFR in particular. Discuss with your doctor or, better yet, nutritionist. CAUTION: There is also evidence that elevated homocysteine can increase the risk of thrombosis, i.e. a blood clot. Of course, clots are responsible for both strokes and heart attacks. NOTE: Let me give you another example of a some other compounds that are known for lowering nitric oxide: Prilosec and Prevacid. These are actually drugs (medications) in widespread use to treat GERD (reflux). They both lower nitric oxide levels, and, as expected, now have research showing that they increase heart disease. You can read more about it here if you are interested: PPI's (Proton Pump Inhibitors) and Erectile Dysfunction. 1) Metabolism, 2006 Dec;55(12):1564-8, "Hyperhomocysteinemia: a novel risk factor for erectile dysfunction"
2) Circulation, 2001, 104:2569-2575, "Homocysteine Impairs the Nitric Oxide Synthase Pathway: Role of Asymmetric Dimethylarginine"
3) Curr Atheroscler Rep, 2006 Mar, 8(2):100-6, "Homocysteine: role and implications in atherosclerosis"
4) Arteriosclerosis, Thrombosis, and Vascular Biology, 2001; 21:1385-1386, ""
5) Am J Clin Nutr, Aug 2000, 72(2):315-323, "Homocysteine and cardiovascular disease: cause or effect?" 7) The Journal of Sexual Medicine, Jan 2010, 7(1pt1):216 223, "Treatment of Erectile Dysfunction Due to C677T Mutation of the MTHFR Gene with Vitamin B6 and Folic acid in Patients Non Responders to PDE5i"
8) European Urology, December 2005, 48(6):1004 1012, "Elevation of Asymmetrical Dimethylarginine (ADMA) and Coronary Artery Disease in Men with Erectile Dysfunction"